Review by Mom Does Reviews: I was super excited to review this beautiful Serendipity Area Rug by Mohawk Home! The color squares are vibrant but earthy and match the color palette in our living room perfectly. “This stunning contemporary rug has a beautiful multi-colored upscale, luxurious look & feel while energizing your room with style.” The rug is 100% Nylon and made in the USA. It is stain and fade resistant, a necessity in our home. The rug is super soft and comfy. My husband even commented that when he was putting something together, he was impressed by how comfortable it was. It is a great addition to our living room. We decorate with earthy tones normally, but the color blocks add some much needed interest in our living room. 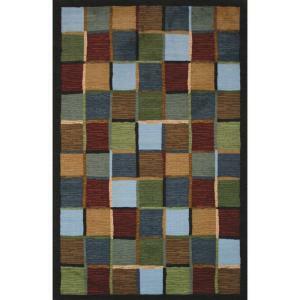 I highly recommend Mohawk Home Rugs for anyone who needs to spruce up a room in your home. I was also given a 5ft by 8ft Rug Pad to keep our new rug in place. We have 2 dogs of our own and watch other peoples dogs as well. The Pad is vital to keeping our rug in place and also to add cushion for tired puppy bones and comfort for my son. He loves to lay on the floor and play LEGOS, Wii or just hang out. The rug pad makes a big difference. My son had a friend over last weekend and the rug was so comfortable, they slept right on the living room floor! About Mohawk Home: Mohawk Industries is one of the foremost manufacturers and distributors of residential and commercial flooring in the world. We enjoy leading market positions across multiple flooring categories, including carpet, ceramic tile, stone, wood and rugs in the United States and laminate in the U.S. and Europe. Mohawk dates its roots to the 1800’s when it became one of the first American carpet manufacturers. Today the company is headquartered in Calhoun, Georgia with operations on three continents. Special thanks to our sponsor, Mohawk Home for offering 1 lucky reader a rug valued at $150! Disclosure: Mom Does Reviews was given this product for review purposes only. I was not given any monetary compensation and all opinions are 100% my own and my differ from yours. Mohawk Rugs will be shipping the prize directly to the winner. Visit Mohawk Home’s Facebook page to enter to win the Mohawk home $1,000 Summer Splash of Color Giveaway. *Remember your chance of winning increases when you friends enter for your suggestion. You get one additional entry per friend. Up to 5 friends! Grand PrizeOne Grand Prize Winner will win a $1,000 room makeover of Mohawk Home product. Up to a $1,000 retail value! Winner will be randomly selected. 2nd Prize2 Lucky second prize winners will be randomly selected to choose a rug of their choice up to a $299 retail value made exclusively by Mohawk Home. « STOMP Out Bullying™ with Soap & Glory! I need a rug for my daughter’s room! Either the living room or my bedroom. I would put this in my room. The new rug would go in my Living Room. I would put it in my living room. The colors in the rug are the colors in my living room already! Either Dining room or master bedroom, I don’t have a rug for either right now and this would be wonderful! The Front room is where this would go! i would put the new rug in my living room!! i really need one in there so my fingers and toes are crossed!! This rug would be so nice to have in my living room. I need a focal point there and a soft place for my boys to lounge would be great too! My kitchen. Super cute rug! I would put it in the sunroom! I would put this rug in my Family room to replace one that is getting old. I would replace the rug I have in the family room since the one there now is getting old. THAT WOULD GO PERFECT IN NY DINNING ROOM………………….. This beautiful rug will go in the livingroom of our soon-to-be new home! It would go in the living room! This will definitely go in my living room. This is a very nice rug for someone, hopefully me! awesome giveaway! The living room – thanks! My new rug would go in my soon to be redone dining room! It would go in my livingroom. I would love it in my family room.!! Thanks so much for this giveaway..!! The rug would go in my living room-we need a new one desperately!!! It would go in my living room. I have two dogs that are just now getting out of the puppy phase and they ruined my last two rugs. I really could use a new rug. If I won a rug, it would definitely go in our main living room. A real centerpiece! It would go in my living room for sure! The rug that is pictured would go great in our breakfast room. I think it is awesome when a product that is made in the USA is promoted. I think you/bloggers should search out and actively promote more of these companies. Thank you! The den/office my husband is making for me. my living room- thanks for a chance to win!!! I would put the rug in my office. IT WOULD GO IN MY LIVINGROOM THANK YOU. This rug would be perfect for my room! My rug would adorn my living room! I love the color of the rug above. I would put it in the bedroom on a chilly wood floor. Thanks for the fine review.I have always desired a Mohawk rug. Fingers and toes crossed! I would love this rug for the entryway!! Thanks a bunch!! This rug would look great in my new office! Beautiful. Thanks for another great giveaway! It would look beautiful in my living room..
Would go great in the entryway. The first thing everyone saw when they come in. My living room for sure! It needs some TLC.